CDA Vanquish Biactive is a foliar applied herbicide for the control of annual and perennial grass and broad-leaved weeds in amenity and industrial areas. CDA Vanquish Biactive is rainfast within 1 hour after spraying and is non-hazardous, non-irritant (clean label), as well as being ready to use! The product may be used in all amenity and industrial situations. 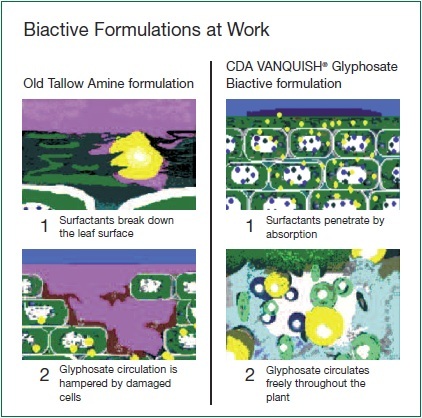 There are no restrictions on the type of area where CDA Vanquish Biactive can be applied, for example; hard surfaces, soft surfaces, around shrubs and trees, and even close to water. CDA Vanquish Biactive controls emerged weeds: annual and perennial, grass and broad-leaved. How does CDA Vanquish Biactive work? Spray when weeds are actively growing and have adequate leaf area to absorb the spray. Perennial grasses are susceptible when tillering and new rhizome growth commences (normally 4-5 leaves). Perennial broad-leaved weeds are more susceptible if treated at or near flowering, but will be severely checked if treated at any time during active growth. To obtain optimum weed control, leave the weeds undisturbed. CDA Vanquish Biactive leaves no harmful residues in the soil, so land can be used for re-planting 7-10 days after application. Grasses may be sown 14 days after treatment. CDA Vanquish Biactive has shown superior control against many common weeds including Docks, Nettles, Clover and Annual Meadowgrass in comparison to conventional biactive glyphosate products. Rainfast trials have shown CDA Vanquish Biactive to be rainfast in 1 hour on weeds (including Couch Grass, Annual Meadowgrass and Creeping Thistle). For further information regarding CDA Vanquish Biactive 5L, contact our Technical Sales Team on 01952 641949.